A very wet start to June! I must say, the weather this week has been some of the worst I can remember, especially Wednesday and Thursday. Just those 2 days saw more than 200mm of rain (measured at my house near Phuket Town), strong gusty winds - nothing too destructive, but some small uprooted trees, minor damage here and there .. including the roof of my kids school! Well, the last update on the blog was at the end of May, and the week had been quite wet, with 200mm of rain falling. So you can see ... we've had pretty much 2 weeks of less-than-average weather and I do apologise to anyone on behalf of Phuket if you have been here on holiday and were expecting nice sunny days! I do tend to hype the low season and many people agree - normally it's not this bad! Now actually, it's not been ALL rain. I Tweeted on June 1st "All blue skies today". That was last Friday. Here's the timelapse from the Patong Beach Webcam - you see? Almost all sunshine. I figured that would be the end of the rain for a while. 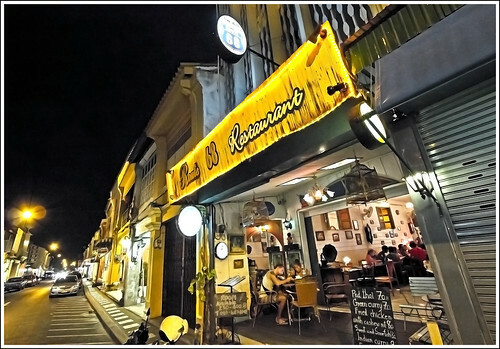 Was a nice evening, we took a walk in Phuket Town visiting the Indy Market and had some food at a small restaurant on Thalang Road. And then the whole week has been pretty wet, with Wednesday and Thursday being especially yukky. Lots of rain, flooded roads, not TOO bad, but enough to affect traffic. Cancelled dive trips and I am sure lots of tourists wondering why the hell they came in low season :) Well, next week will probably be sunny and we'll have lots of tourists happy they came in low season! 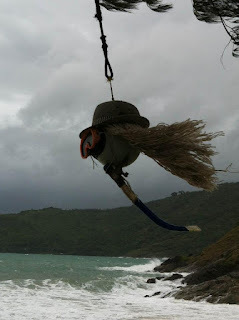 OK, I have been trolling Facebook for some photos of the weather in the last few days, below is a selection showing the less glamorous side of Phuket. When it really rains, this is what you get. OH and there were big waves. When you see big waves, do NOT go swimming in the sea. It's really quite dangerous. The sea is stronger than you. (above) a man getting rescued at Kata beach by lifeguards. 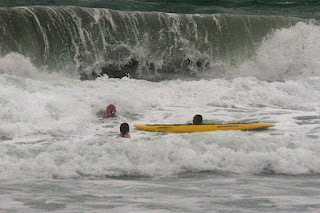 What the **** was he thinking going in the sea?! Photo from The Phuket News. (above) Wind at waves at Ya Nui Beach yesterday. Photo by Frank van der Knoop. 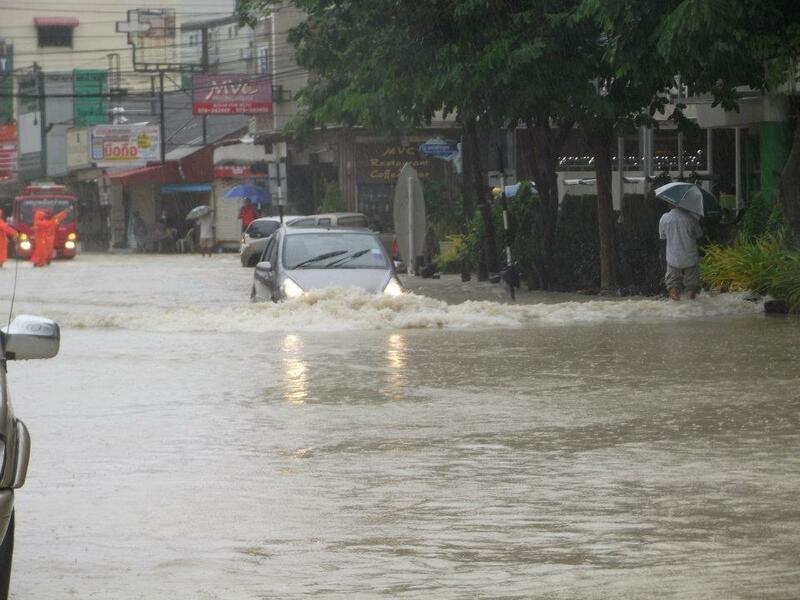 (above) Flooded road in Patong yesterday. 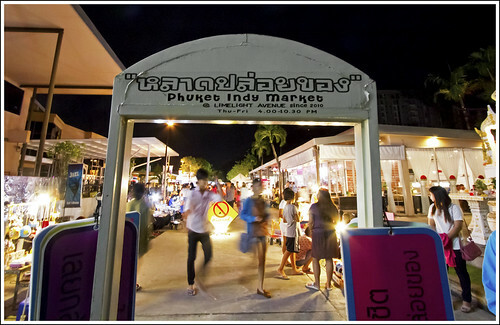 Photo from The Phuket News. This shows the worst of it. 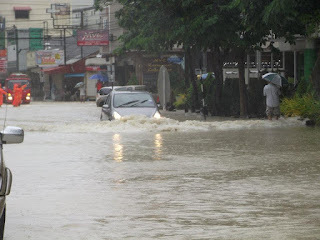 I drove 20km to Karon Beach from Kathu (near Phuket Town) yesterday, the roads were very wet, especially around Chalong, and the traffic was bad. In the afternoon driving back was normal, hardly any water on the road. For all the dramatic images, it was not so bad, just rather wet and miserable, with power outages here and there and areas of localised flooding, but nothing widespread or deadly serious. Certainly not holiday weather though! Below - timelapse of part of yesterdays view from the Patong Beach webcam. Almost non stop wind and rain! I think the power went off during the day, so you can't see the whole day. It was better in the late afternoon. Today was better, some rain, some patches of sun, but still quite windy and with rough seas. Really hoping for a sunny Saturday!